Largest ever Wind Power capacity additionof 5502.39 MW in 2016-17 exceeding target by 38%. During 2017-18, a total 467.11 MW capacity has been added till 30.11.2017, making cumulative achievement 32746.87 MW. Now, in terms of wind power installed capacity India is globally placed at 4thposition after China, USA and Germany. Biggest ever Solar Power capacity additionof 5525.98 MW in 2017-18. During 2017-18, a total 4323.1 MW (including 207.92 MW Solar Roof Top) capacity has been added till 30.11.2017, making cumulative achievement 16611.73 MW (including 863.92 MW Solar Roof Top). So far,1.42 lakh Solar Pump have been installed in the Country as on 30.11.2017 including 1.31 lakh during last three and half year. Solar projectsof capacity 23656 MW have been tendered and LoI for 19,340 MW issued. A capacity addition of0.59 GW has been added under Grid Connected Renewable Power since last three and half years from Small Hydro Power plants. Biomass powerincludes installations from biomass combustion, biomass gasification and bagasse co-generation making a cumulative achievement to 8181.70 MW. Family Type Biogas Plants mainly for rural and semi-urban households are set up under theNational Biogas and Manure Management Programme (NBMMP). During 2017-18, against a target of 1.1 lakh biogas plants, 0.15 lakh biogas plants installations has been achieved making a cumulative achievement to 49.8 lakh biogas plants as on 30.11.2017. Capacity of the scheme for “Development of Solar Parks and Ultra Mega Solar Power Projects” has been enhanced from 20,000 MW to 40, 000 MW.35 solar parks of aggregate capacity 20,514 MW have been approved in 21 States. Kurnool Solar Park in Andhra Pradesh with 1000 MW capacity has already been commissioned and is operational. With commissioning of1000 MW capacity at single location, Kurnool Solar Park has emerged as the World’s Largest Solar Park. 650 MWcapacity commissioned in Bhadla Phase-II Solar Park in Rajasthan. 250 MWcapacity commissioned in Phase –I of Neemuch Mandsaur Solar Park (500 MW) in Madhya Pradesh. 3 new solar parks have been approvedin this year at Rajasthan (1000 MW), Gujarat (500 MW) and Mizoram (23 MW) after issue of Guidelines for Enhancement of capacity from 20, 000 MW to 40, 000 MW under Solar Park Scheme. As on 30.11.2017 over41.80 lakh Solar Lighting Systems, 1.42 lakh Solar Pumps, and power packs of 181.52 MWeq have been installed in the country. Major achievements of 18.47 lakh Solar Lighting Systems, 1.31 lakh. Solar Pumps, Power Packs of 96.39 MWeq have been reported during last three and half years. UnderDefence scheme against a target of 300 MW, 357.50 MW has been sanctioned; under Central Public Sector Undertakings (CPSUs) scheme against a target of 1000 MW, entire capacity sanctioned; under 3000 MW Bundling scheme, Tranch-I: 3000 MW has been tendered; under 100 MW Canal Bank/ Canal Top scheme, all capacity sanctioned; under 2000 MW & 5000 MW VGF Scheme; and under 20,000 MW Solar Park scheme, 35 Solar parks have been approved in 21 States with aggregate capacity of 20,514 MW. So far sanctions for 1767 MWp capacity solar rooftop projects has been issued and around 863.92 MWp capacity has been installed. 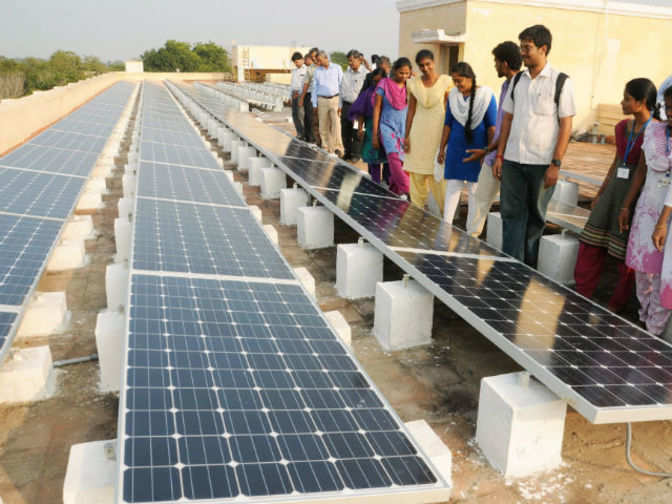 Concessional loans of around 1375 million US dollarsfrom World Bank (WB), Asian Development Bank (ADB) and New Development Bank (NDB) have been made available to State Bank of India (SBI), Punjab National Bank (PNB) and Canara Bank for solar rooftop projects. Suryamitra programmehas been launched for creation of a qualified technical workforce and over11 thousand persons have been trained under the programme. An online platform for expediting project, approval, report submission, and monitoring of RTS projects has been created. Initiated geo-tagging of RTS projects, in co-ordination with ISRO, for traceability and transparency. Launchedmobile app ARUN (Atal Rooftop Solar User Navigator) for ease of access of beneficiaries for request submission and awareness. MNRE has allocated Ministry wise expert PSUs for implementation of RTS projects in various Ministries/Departments. Published best practices guide and compendium of policies, regulations, technical standards and financing norms for solar power projects. 4thposition after China, USA and Germany. Signing of PPAs/ PSAsfor first SECI wind auction (1000 MW, tariff discovered was Rs. 3.46 in Feb 2017). Second wind auction of 1000 MW which resulted in lowest tariffs of Rs. 2.64/ unit. India has long coastline where there is a good possibility for developing offshore wind power projects. The cabinet has cleared the National Offshore Wind Energy Policy and the same has been notified on 6thOctober 2015. Certain blocks near Gujarat and Tamil Nadu coast line have been identified. First LiDAR installed and commissioned off Gujarat coast for gathering wind resource data. Wind Forecasting: Based on wind forecasting experience of Tamil Nadu with NIWE, MoUs for forecasting done with Gujarat and Rajasthan. Meso scale mapprepared for wind resource at 120 meter height, as most of turbine hub heights being installed are more than 100 meters. Total assessed wind resource of India would go up from 302 GW at 100 m to about 600 GW at 120 m); MESO scale map also prepared for Offshore wind. However for actual use these would have to be correlated with actual site specific measurements. Bidding guidelinesfor wind auction under Section 63 of Electricity Act have been notified in December to Ministry of Power. Family Size Biogas Plants mainly for rural and semi-urban households are set up under the National Biogas and Manure Management Programme (NBMMP). During 2017-18, against a target of 1.10 lakh biogas plants,0.15 lakh biogas plants installations has been achieved making a cumulative achievement to 49.8 lakh biogas plants. Intra-State Transmission System is being implemented by eight renewable rich States (Tamil Nadu, Rajasthan, Karnataka, Andhra Pradesh, Maharashtra, Gujarat, Himachal Pradesh and Madhya Pradesh) withtotal project cost of Rs. 10141 crores, with funding mechanism consisting of 20% State Equity, 40% Government of India Grant (total 4056.67 crores) and 40% KfW loan (500 million EUR). The project includes about approx. 9400 ckm transmission lines and Substations of total capacity of approx. 19000 MVA to be completed by March 2020. The purpose is to evacuate approx. 20,000 MW of large scale renewable power and improvement of the grid in the implementing States. India is taking a leading role in the International Renewable Community and was a leading country along with France in formation of International Solar Alliance (ISA), an international body of 121 countries lying between Tropic of Cancer and Tropic of Capricorn. 47 countries have signed the Framework Agreement and 18 countries have ratified it within 1 year of opening of Framework for signature. Accordingly, ISA became alegal entity on 6.12.2017, with its headquarters in India.